Maude and Flo are two minor non-playable-characters found in the game Paper Mario: The Thousand-Year Door. They are two of the many crows sitting on the trees scattered across Twilight Town. Unlike the other crows however, Maude and Flo are the only ones with known names. 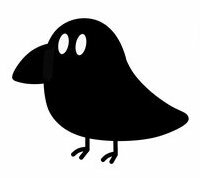 Like all of the birds in Twilight Town, Maude and Flo pretend to be normal crows around other people, but gossip as soon as they are left alone; Mario can use Vivian's abilities to eavesdrop on their conversations. Maude and Flo especially like to talk about their families and the careers of their children. Maude is married to a crow named Bob and has a son named Billy, whereas Flo seems to have many children, the oldest one being a son named Ronnie. As Mario progresses in the game, Maude's and Flo's relatives also evolve and live their lives. This page was last edited on February 17, 2018, at 23:56.